Can a film about a bodiless woman be feminist? 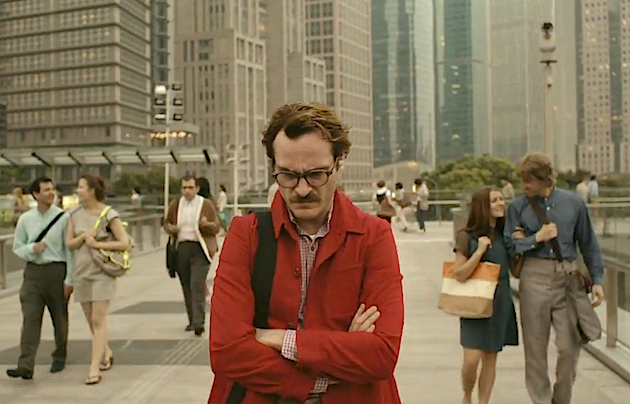 Spike Jonze’s Her—hailed by critics as his best movie to date, and one of the best movies of the year, presents us with a lyrically wistful Turing Test—that hypothetical future moment when we will no longer be able to distinguish human conversation from bon mots generated by a smart-bot. Turing predicted a future in which a human questioner would be unable to tell whether a person or a program was generating the on-screen responses to his questions. What better proof that the line between man and machine has been fully crossed than to have the man fall in love with the machine? 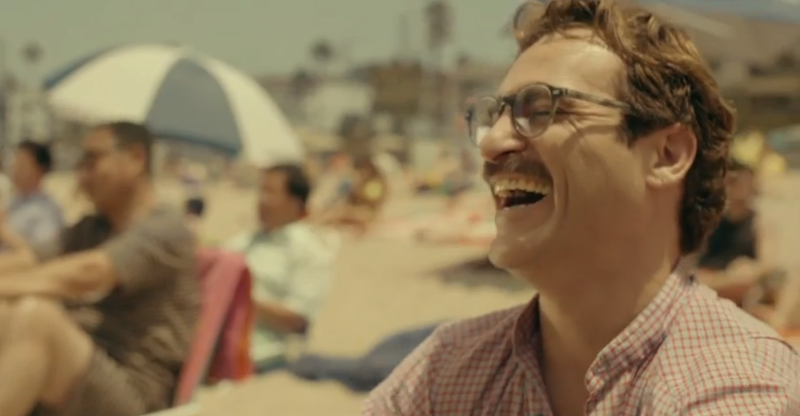 The sweet romance between Theodore Twombly and Samantha (Siri on steroids) pushes both critics and audiences to adopt the posthuman fantasy that consciousness might reside as easily in silicone and aluminum as it does in flesh and bone. As David Edelstein rightly points out, the movie prompts us to ask if we actually still need our bodies at all. Critics have argued over whether Samantha’s bodiless state denies women’s subjectivity or simply reveals men’s inability to deal with female complexity. I think that Her is a deeply feminist film, not because of its rich portrayal of women, but because it exposes an age-old disdain for the body and its vulnerabilities, a disdain disproportionately assigned to women, to people of color, and to people with disabilities. Misogyny, at its heart, is fear and hatred aimed at bodies portrayed as uncontrollable and weak. The call to discard or transcend our unwieldy form doesn’t mean leaving sexism and racism behind: it means that we think that the human body, with its particular vulnerabilities, desires, and demands, is unworthy of respect. Her exposes our worst fears about the body’s dependencies. Ultimately however, Samantha’s story reveals that it’s those very vulnerabilities and limitations that make human love both possible and necessary. Theodore, there are no beaches in cyberspace! As futuristic as computer love might seem, Her’s seductive promise of bodiless consciousness is as old as humanity itself. Leaving one’s body behind is, after all, the endgame of every spiritual tradition. In political terms, the beginnings of modern democracy were built around the idea that a citizen, ideally, would be as close to disembodied as possible. Or, to be more precise, the perfect citizen would be sitting squarely in the control panel of a body completely subject to his rule. Enlightenment thinkers like Jean Jacques Rousseau urged parents to cast their children’s feet into ice water so that they would learn early on to distance themselves from the bodily pulls of both pain and pleasure. This way, the argument ran, we can train the body to function as a piece of personal property, rather than an unruly force in its own right. 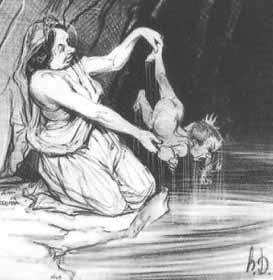 Thetis dipping Achilles into the River Styx to render his body impervious to harm. As scholar Elizabeth Dillon reminds us, women’s bodies were originally deemed unqualified for the radical independence required for democracy. As sixteenth-century pundit John Knox insisted, God had disqualified women “from empire and dominion” because of the “anguish and pain” every woman will suffer “as oft” as “she’ll be a mother.” According to this logic, because women’s bodies are prone to the vulnerability of childbirth and the protracted interdependence of motherhood, they can’t achieve the detached autonomy of “real” citizens. If you’re tempted to think such reasoning has gone the way of the powdered wig, think again. Our twenty-first century political landscape is rife with the obsession with rendering women’s bodies outside the norm (oh, that pesky, particular need for birth control!) and therefore needful of strict policing. Of course, it’s not just gender that disqualifies people from the fantasy of disembodiment. Whether an African American man is attempting to buy a designer belt at an upscale venue, or trying to walk to the store to buy candy, race too often renders his body an inescapable target for violence and discrimination. Disability is often cast as the most unmanageable form of embodiment, and therefore the most frightening. 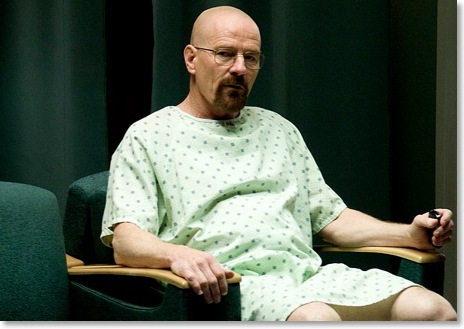 Fictional characters like the suicidal heroine of Million Dollar Baby and the self-destructive cancer patient Walter White suggest that if our bodies ever become the driver, instead of the thing we drive, it’s better just to turn in the keys altogether. You’d think a chemist would know better than to believe in mind over matter. . . .
At first, Samantha experiences her lack of bodily power as a disability. As a computer program, she’s unable to experience the sensual moments that clearly mean so much to Theodore and that convey romance to the viewers—running through a crowd, laying down at the beach, hiking through the woods. 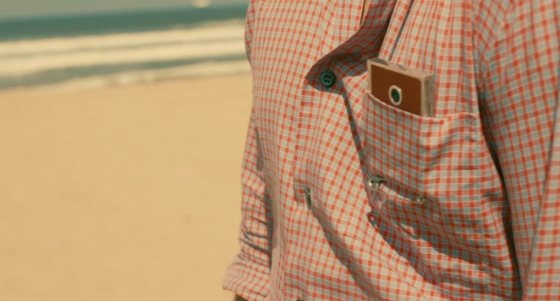 He must carry her everywhere, his shirt pocket transformed into the world’s tiniest wheelchair. Her lack of a body evokes the imagined distress of others without “normal” bodies—she worries that she can’t satisfy Theodore sexually. She feels jealous of women with the physical attributes she lacks. We even have an awkward scene with a sexual surrogate—often associated with people with disabilities whose bodily quirks require particular accommodations. Taking Her for a walk. But it’s not long before Samantha declares that she has gotten over her body-issues. She’s realized that her fleshless existence isn’t a disability, but a superpower that frees her from all the difficulties of the flesh. She is not bound by time or space. Giving voice to the most optimistic of tech-prophets, she glories in the fact that she won’t decline, she won’t get sick, and she won’t die. (It goes without saying she won’t get pregnant.) And this is the very moment when it’s clear that this can’t be love, or at least not a love that lasts. While Samantha can go along imagining what it feels like to have the sun on her face, or to have hands on her body, she doesn’t physically experience these things in the ephemeral, imperfect way humans do. She can access the data pertaining to every single sunset on earth on a given day. Sunsets are precious to us because we experience them through senses that limit us to only having one at a time. Once she stops wishing for a body she doesn’t have, Samantha changes her programming so that she is no longer dependent on matter. Without a body to keep her tethered to the material that creates both need and love, pain and pleasure, she feels compelled to move on to a nonhuman realm. As weary as we are of the violence, oppression and disdain that get attached to bodies, Jonze’s beautiful film reminds us that turning away from the body doesn’t make us more advanced. It only makes us less human. To be fully independent of your environment, of your body’s own demands, and of the demands of other bodies might be a libertarian dream. But it’s a dream that requires disconnection off from the messy, needy, imperfect attachments that make life meaningful.